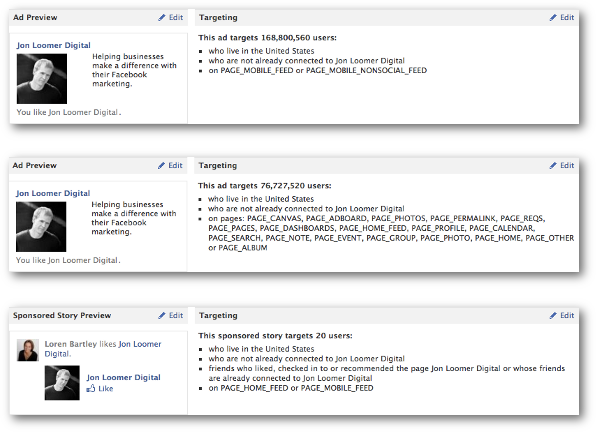 In 2012, Facebook allowed Page admins to easily create an ad campaign to promote a post with a single click from the Timeline. Now they have the same ability to promote their Page. That’s right. If you promote your page with this method and skip away, your promotion will run indefinitely until you stop it. You cannot customize beyond these. This would make sense for local businesses, but Facebook doesn’t allow me to edit this to expand to other countries. The first two are standard ads that one would create when promoting a Page. These ads would typically allow you to customize the copy, but of course that copy is automatically generated. The third is a Sponsored Story. Based on the description, it appears that the first ad appears on mobile. However, this is not the type of ad that tends to appear on mobile devices, and based on viewing this in Power Editor, it does not look like that’s the case. The second is a standard ad that would appear in the sidebar on desktops. I’m not clear the difference between the first two ads, though Facebook indicates a significantly different potential audience. If you know the difference, let me know. The third is a Sponsored Story that goes only into News Feeds — both desktop and mobile. This concerns me for the typical marketer that decides to promote a Page with this option. Depending on how you classify your business, Facebook will pull the copy of this ad from either your Description or Mission. For me, it pulled from my Mission. This made for a very poorly worded ad that cut off mid-sentence. Once you edit the Mission or Description, the ad is updated in real time. So make sure you take a close look. You’ll need to keep the copy at or under 90 characters (see this post on Facebook ad dimensions for reference). I look at this option in the same way I look at Promoted Posts. 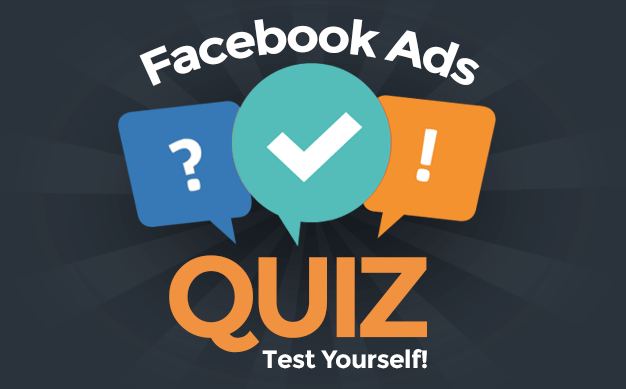 It is Facebook’s way of making advertising much, much easier for the typical marketer. It’s so simple — even tempting — to promote your Page in this way. But it’s also the lazy way. When you create a Promoted Post or Promoted Page (or whatever it’s called), you are telling Facebook to create a very templated campaign lacking any customization. No additional targeting. The Sponsored Story appears in the News Feeds of friends of Fans. That’s fine, but it will appear in the News Feeds of people who don’t have any interest in your subject matter. You could eliminate this with further targeting. The sidebar ad(s) appear(s) — again, not sure if both are in the sidebar — for anyone in your city, state or country (depending on what you selected) not currently connected to your Page. That’s a lot of freaking people. A lot of freaking people who won’t care about your Page. Granted, I still occasionally use the Promoted Post option. I’ll undoubtedly use this, too. I may even do it and go in to delete the sidebar ad(s). But I’ll only do it when I don’t have the time to create a more effective, targeted campaign. 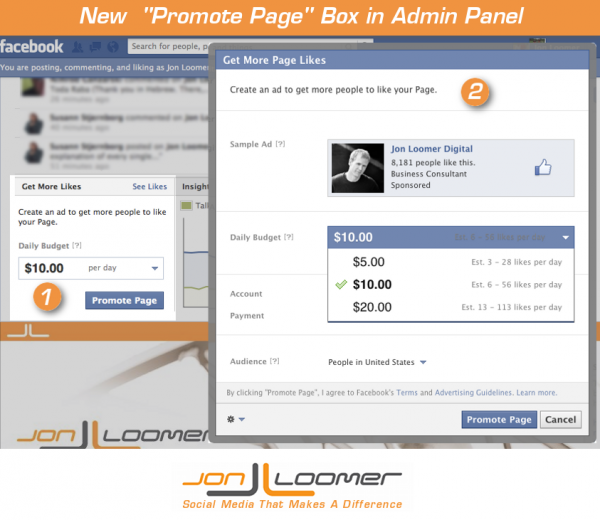 Will you promote your Page in this way? Let me know in the comments below!